I don’t think I love a theatre anywhere in London more than the Union, a scruffy little fringe space underneath a railway arch on Union Street. It’s been there since 1998, long before Tate Modern, the Jubilee Line or the Shard came to this part of London. There are certainly grander theatres on the South Bank, such as the National, which, for its recent £80 million refurbishment, won The Stage Award for theatre building of the year. There are also more influential London theatres, such as Shakespeare’s Globe (whose West End transfer last week for Nell Gwynn got a five-star rave from me), the Old Vic (currently undergoing a renaissance under new artistic director Matthew Warchus), the Unicorn, and — previously featured in this column — the Young Vic, the Menier Chocolate Factory and Southwark Playhouse. Two of those, the Young Vic and the Menier, have shows now playing on Broadway in A View from the Bridge and The Color Purple. But the Union is one of the enduring wonders of the London fringe: a tiny, slightly grotty, but completely irresistible and flexible theatre space that I consider my favourite local theatre. My own writing is literally on its walls; in 2011 I dubbed it in The Stage “the National Theatre of the fringe”. The writing has also been on the wall for this theatre for some time, as its landlord, Network Rail, first served it a verbal warning in 2013 that they were looking at converting it into offices. However, artistic director and founder Sasha Regan has worked with her landlords to find an alternative — and it is right across the street. In May, the final show — still to be announced — will play at the current Union, and it will finally close after a run of 18 years. 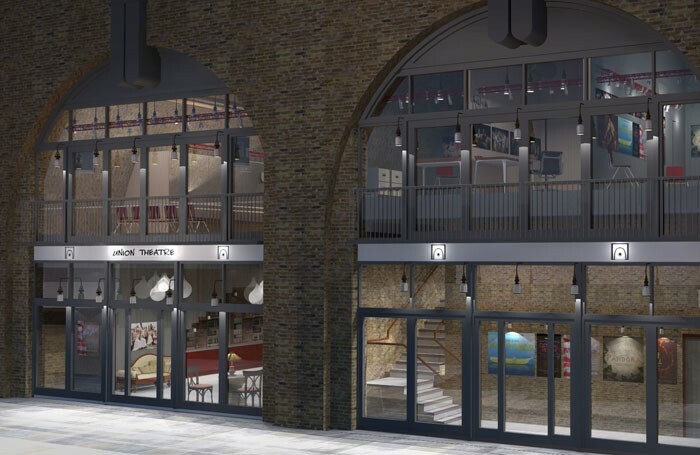 In mid-June, it will re-open in two newly-refurbished railway arches across the way, including a new bar and cafe in one arch (replacing the current outdoor cafe) and an expanded theatre in the other that will see the seating capacity go up from 50 to a more profitable 75. Of course, its costs are going up, too — the rent is more than three times their current commitment — but the new premises will include a large rehearsal room upstairs, with natural light, that can be let out to commercial producers (Regan notes ruefully that she won’t be able to afford to rehearse her own shows there but, as happens at present, she’ll have to use the theatre space itself). There will also be three offices, the smallest one for the theatre and two others that again can be let commercially to help cover the rent. I’m also going to miss the old Union — though not the awful toilets (the new venue will have five, including a fully accessible disabled toilet). There was always something magical about entering its decrepit space, and wondering just what configuration you would find it in today. (The new space will be similarly flexible.) I’ve long been one of the community who daily frequent its cafe to buy a coffee on the way to the office I rent around the corner, and I’ve gotten to know many of the regulars who do the same thing, like Barney and Mark (and Mark’s greyhound, Harry). Special praise to Ian, his dad Mick, Andy and Howard for the cafe they run so well. But what matters inside the theatre are the shows. A constant parade of mostly young talent regularly makes its post-drama school London stage debuts here, but it is also a theatre where more established talent regularly tests its mettle too. A couple of years ago, it was thrilling to see Vicki Lee Taylor, who had just finished playing a principal role in A Chorus Line at the London Palladium, open the following week at the Union Theatre starring, quite brilliantly, in a rare revival of Alan Jay Lerner and Burton Lane’s musical On a Clear Day You Can See Forever. When Sondheim’s Pacific Overtures was staged here in July 2014, I wrote that the show “may just be the most audacious and courageous of all the mould-breaking shows Stephen Sondheim has written, and Michael Strassen’s sombre, shattering staging matches its ambition with a lean, stripped-back intensity.” Actor-turned-director Strass (as he’s known to his friends) has also been responsible for outstanding productions of Sondheim’s Assassins and Company at the Union, as well as Dana P Rowe and John Dempsey’s The Fix — all shows once coincidentally produced by Sam Mendes during his tenure at the Donmar Warehouse. The Union’s productions were each equal in their daring and imagination to Mendes’ productions – but on a fraction of his budget. Strass is not the only director or choreographer to make a mark at the theatre. It was here that Drew McOnie — now the fastest rising choreographer on the block — first came to my attention with a production of Dames at Sea in 2011, working with director Kirk Jameson, whose own splendid work at the Union has also included the aforementioned On A Clear Day. Sasha Regan has herself established a profitable Union brand in the all-male Gilbert and Sullivan productions that she has staged, with The Pirates of Penzance going on to run at Wilton’s Music Hall, and tour Australia and the UK. With producing partners Ben De Wynter and now Hilary Williams, they’re next taking the Union-originated HMS Pinafore on the road, launching at Cambridge’s Arts Theatre from April 20, including London dates at Hackney Empire and Richmond Theatre. I also became personally obsessed by the theatre’s 2014 three-show retrospective of some lesser-known shows by Howard Goodall, who is, for my money, the greatest living British composer of musicals. Each has been a revelation again, including glorious productions of the adult professional premiere of The Dreaming, originally commissioned for and performed by a youth company, and the first London revivals of Love Story and Girlfriends, the last two of which flopped in their original West End incarnations. It’s a theatre that regularly takes chances instead of ploughing the familiar repertoire. In an area of fast-rising gentrification — right across the street is a Gordon Ramsay restaurant — the Union offers nourishment for the soul. Long may it continue serving this invaluable commodity.